This study establishes competency indicators for digital electronics contestants in skills competitions to examine instructor importance levels as well as to observe the competency indicator performance of the contestants these instructors had trained. Using a purposive sampling method, the digital electronics skill competition "Golden Hand Award" winners and the 65 teachers selected from Taiwan who had trained the competition contestants in 2007-2015, were taken as the subjects for an importance-performance analysis (IPA). Competence was measured using the five indicators of general discipline, professional field, self-management, characteristics, and professional skills; 17 indicator connotations; and 67 indicator items. It was observed that instructors found professional field indicator facets to be the most important for teacher indicator importance levels, and that professional knowledge and abilities were the most important for the professional field. The results showed the most important of the instructors' cognition in dimensions to be specialised field, and the most important of the instructors' cognition in specialised fields to be professional subjects; the best performance of the contestants in dimensions to be professional skills, and the best performance of the contestants in professional skills to be the ability to measure. Skills development needs to be focused on learners' lives and current occupational skills. Thus, as competition is a strong factor in learner motivation, government organisations and vocational high schools hold various competitions to encourage students to learn and enrich their knowledge and skills (Chen & Chen, 2010). To enhance the learning interests of students, it is necessary to allow teachers to exchange teaching experiences and ensure the school curricula meets the needs of the community and connects with international trends. Therefore the Ministry of Education in Taiwan has been holding national skills competitions for Vocational High School students since 1957, with the aims of offering students fair competition, promoting a solid training mode for Taiwanese enterprise personnel, and exploring the future development of industrial technologies. Students need to be seen as the workforce of the future; therefore, work skills preparation is an important issue in a constantly changing international world (Kumpikaitè, Ramirez & Ribeiro, 2012). As an increasingly greater number of students emphasise academic performance, there has been a consummate rise in skills development. Under the influence of globalisation, educational institutions now need to consider which skills students will require, and which age to ensure skills development appropriate to entering the workforce (Maryam, Davoud, Zahra & Somayeh, 2011). Currently, there are five kinds of national skills competitions for senior secondary school students: industrial, marine aquatic, housework, commercial, and agricultural; with industrial skills competition being the largest. Vocational technology competitions in vocational schools are only available in the field of vocational and technical education in Taiwan. The senior secondary school students attending these national skill competitions learn more and develop strong, specific skills. In Taiwan, if a contestant wins an outstanding award, they can enroll in the University of Science and Technology through the excellent skills selection programme, or be nominated as the national representative in international skill competitions and gain glory for their country. In addition, an award can be used as a reference for the instructors to determine an athlete's ability during training. Finally, it can be used as a reference to upgrade countries in technical education, for example: including Vocational Education and Training (VET), Technical and Vocational Education and Training (TVET), further education and training (FET) and other agencies. The respective skills teachers are in charge of selecting the representative contestants from their schools to take part in the skills competitions. In the current educational environment in Taiwan, if the skills performances of the students are similar, it is often difficult to select a contestant; should a student with moderate academic performance or excellent academic performance be encouraged to join the contest. This is the intended focus of this research, namely, the way in which how instructors can select the most suitable students for these contests and what characteristics these contestants should possess. As the influence of the instructor on contestant performance is profound, we examine the instructor competency importance levels using an IPA to examine and observe contestant performances, with the aim of developing a reference guide to assist instructors select contestants and to guide the contestant training process (Martilla & James, 1977). In Africa and worldwide, investments have been made in primary education with the expectation of a skilled and healthy labour force, increased productivity, higher wages, and high employment rates (Boateng, 2014). Today, vocational education is seen as training for future work and future training so as to facilitate the continuing development of vocational-specific skills over a lifetime. In school systems in almost all African countries, like elsewhere in the world including Taiwan, general education programmes are intended to give students the tools to be able to continue their education to higher levels; vocational education, on the other hand is for those students who opt to focus on immediate employment opportunities (Oketch, 2007). The purpose of this article is to contribute to this methodological literature by applying the importance-performance technique. The importance-performance analysis (IPA) may be used to compare a measure of the relative significance of attributes to a destination organisation's success, that is, increase the number of meetings and delegates. The technique is based on the assumption that an organisation can enhance its success by ensuring that it performs well in attributes that meeting planners consider important. It has proved effective in assessing the competitive superiority of destinations in various areas (Go & Zhang, 1997). As a developing economy, South Africa recognises the importance of a skilled workforce to enable economic growth and wants to ensure that vocational education supports the transition from education to employment. In response to the rapidly-growing needs of South Africa's mining industry, railways, and other industries emerging at the time, vocationally oriented education in South African schools started in the 19th and 20th centuries with the establishment of technical colleges and formal apprenticeship training, with the main focus on artisan training. Following the establishment of a democratic government in 1994, work started immediately on the development of a new school curriculum to improve the quality of school-based education for all learners. Vocational Education and Training (VET) in South Africa is delivered through secondary and tertiary level education, as well as through apprenticeships and work-based training. In South Africa, vocational education is in the domain of the FET colleges; however, vocational training is also part of the school system. Because of South Africa's critical need for technical and artisan skills, it is necessary to develop a policy framework that makes focused vocational schools an attractive option within the diversified education sector. Therefore, strengthening learner exposure to all forms of vocational orientation as part of general education is vital in order to introduce developments and opportunities in technology, agriculture, and other fields. Further to this, effective school to work transitions is critical in both developed and emerging economies. Previous research has found that effective vocational programmes can be part of the answer, as they provide practical training linked to the prospect of a job, smoothing the transition from school to work (Field, Musset & Álvarez-Galván, 2014). There are two main challenges to strengthening professional development for vocational teachers. The first is the need to improve the skills and qualifications of the lecturers in the TVET system, an issue that is already being addressed through current proposed reforms. The second challenge is the need to improve the professional preparation of college leaders (Field et al., 2014). As targeted support for students with weak foundation skills is essential, VET can provide the skills for entering into the labour force and supporting successful professional careers (Eichhorst, Rodriguez-Planas, Schmidl & Zimmermann, 2012; Organization for Economic Co-operation and Development [OECD], 2010). More than a million students are currently enrolled in vocational programmes at public and private TVET institutions (around 770,000 students), technical schools (44,000), government supported work-based learning (130,000), and higher certificates and diplomas (280,000) (Field et al., 2014). As the rate and nature of economic change shape the patterns of employment and the skills needed in society and determine the incentives for individuals, employers, and society for investment in skills development, it has a strong impact on education in general, and TVET in particular. Thus, TVET is being reformed to address local social and economic demands (Tabbron & Yang, 1997). In Taiwan, skills competitions for senior secondary school students are an annual event for vocational education institutions mostly held in November, with many schools selecting and training contestants from the first grade or the second grade onwards. Instructors generally spend time after class, training the contestants to enhance their skills, with the training processes, equipments, parts and materials being given both financial and administrative support from the schools. As these competitions cultivate self-confidence and motivate student interest, choosing the best students as contestants had become important (Chen & Chen, 2010). The purpose of skills competitions is to demonstrate a complete understanding of the technical and vocational education training effects in upgrading skills levels. The relevant units hold skills competitions and publicly praise those contestants who show excellent skills. Not only do these competitions encourage students to learn from each other, but direct attention to the social skills necessary to develop top technical talents. As skills competitions allow schools to observe each other's teaching environments, success can improve a school's reputation, motivate students, and promote technical skills development. For teachers, observing and participating in such competitions can improve teaching methods and skills development in the use of equipment and instruments, thereby facilitating a type of self-training enriching both preparation and delivery. For society, the promotion of such competitions involving people in vocational education and training can upgrade industrial technological knowledge in the workplace and promote the national economy and social development. Therefore, skills competitions are helpful for schools, teachers, students and society because of the focus on skills upgradation. To train skills competition contestants, school administrative units need to invest a great deal of manpower and resources, and instructors and contestants need to devote even more time after class to training. To arouse the interest and motivation of schools to develop skills and enthusiastically participate in competitions, the Ministry of Education also gives rewards such as offering exam-free admission to competition winners. Construction of the Competency Indicators There have been many different methods used to construct competency indicators in education and training research. Generally, however, technical and vocational education has tended to build competency indicators based on the needs of the skills to be assessed. In this paper, the indicators were developed based on a theoretical analysis of the literature, a review of professional knowledge, industry field interviews, the Delphi method, and expert discussions and a questionnaire. To construct the final competency indicators, the qualitative and quantitative findings were combined. As this research adopted the methods of American educational psychologist, Benjamin Bloom, for the competency indicator construction, the teaching targets were divided into three domains, namely: cognition, affection, and skills. The cognition domain refers to the development of intelligence, such as development of base concepts, understanding the underlying meanings and the content; the affection domain refers to the ideas, attitudes, and values; and the skills domain refers to technological abilities such as actual expressions and operations (Zhang, 1999). A good technological knowledge is usually one of the key factors when choosing skill contestants; however, academic performance and learning attitude are also very important. The professional competency indicators for digital electronics contestants in industrial skill competitions can be divided into three indicator categories, five facets, and 17 individual items. Importance-Performance Analysis (IPA) Martilla and James (1977) proposed the IPA, to examine the consumer assessment of the importance and satisfaction degrees to analyse the service quality of the automobile industry to improve a marketing strategy (Martilla & James, 1977). The importance degree was placed on the x-axis, and the satisfaction degree on the y-axis, with the mean being the central coordinate in a two-dimensional matrix. The importance and satisfaction degrees were divided into four quadrants, each of which had a different focus (Sampson & Showalter, 1999). A questionnaire was conducted on the instructors to extract their perspectives about the importance of cognition and the value of the contestant competency indicators, with the instructors of award-winning contestants constituting one group and the instructors who had trained contestants but failed to win constituting the other group. 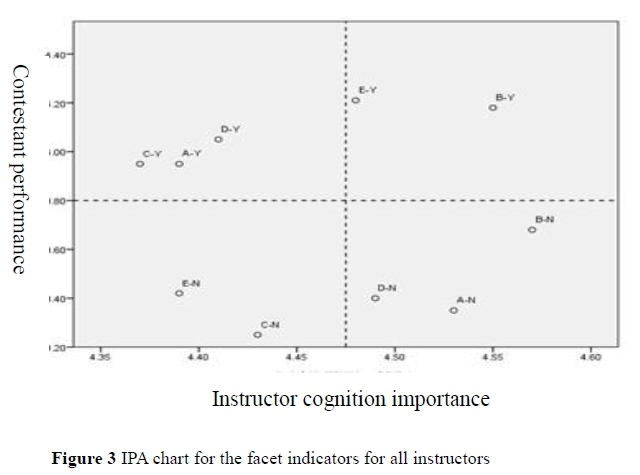 The IPA was used to check the competency indicator importance based on the instructor assessments and the actual contestant performances, the results for which are shown in Figure 1 (Martilla & James, 1977). Based on the research findings, with the aim of providing accurate references for training plans for schools and teachers, we developed a comprehensive trait list for successful contestants and compiled cautionary notes for the competition based training process. After constructing the competency indicators for digital electronics contestants at skills competitions, we use the IPA to examine the relationship between competency indicator importance based on instructor cognition and the contestant's actual performance. First, we collected domestic and foreign related research and digital related electronics data, and collated data for each ability connotation based on facets, items, and details. The draft content of the questionnaires was reviewed and revised by experts and after applying the Delphi technique to the expert questionnaire at least three times (Shyr & Lo, 2012), research tools were developed to measure the competency indicator importance for digital electronics contestants in skills competitions, and the contestant performance scale questionnaire. Using purposive sampling, the questionnaire was conducted on the selected participants, after which the IPA was used to check the competency indicator importance for contestants and their performance results for further discussion and analysis. 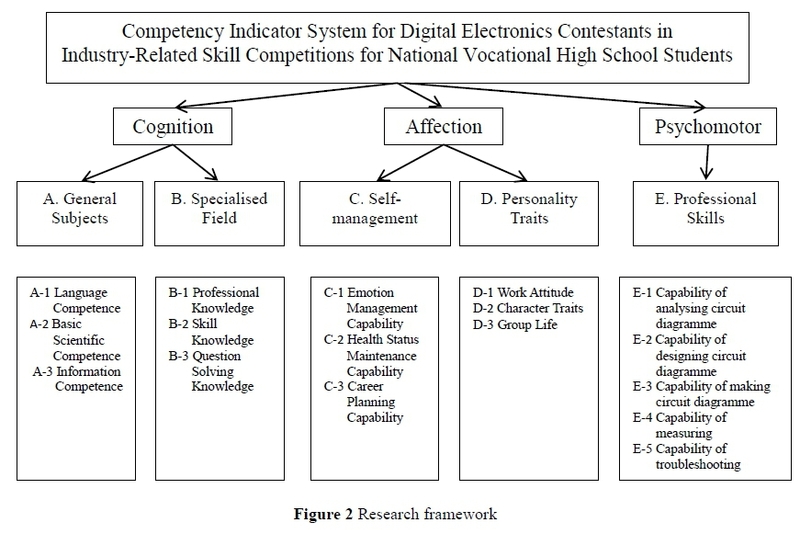 From the motivation and purpose of the research, after exploring the core competencies for the Electrical and Electronics group, and analysing the related competency indicator periodical papers, three competency indicators (cognition, affection and skill) were developed for digital electronics contestants in skills competitions, which were then divided into five facets, 17 items and 67 details, as shown in Figure 2. We invited five experts and scholars including university professors in related fields and competition judges to provide expert advice. The panel of judges represented academicians with expertise in Digital Electronics Contestants behaviour, the professional titles was shown in Table 1. The purpose of expert review in this study, and discussion are conducted to make the preliminary study architecture. Whether the breakdown of competency indicators is appropriate, whether the terms used need to be amended, whether the order needs to be adjusted, whether arrower narration is excessively lengthy or simplistic, whether the category is appropriate or confusing, and the degree of effectiveness of the questionnaire degree. The experts have divided into each indicator detailed options applicable, deleted and amended. If experts think that contents needed to be amended, they can fill in the revised comments column to amend the comments. For the Delphi technique expert group, we invited nine teachers from the Electrical, Electronics or Information technology departments at Senior High Schools and Vocational High Schools, including senior teachers, department directors, and skill competition instructors, the professional titles was shown in Table 2. Based on the valuable experiences and opinions of experts and scholars, we carried out three rounds of consultation on questionnaire after making detailed changes and amendments to the competency indicators, until a consensus of consensus was reached, and constructed into a technical engineering contest digital electronic type of ability indicators. We invited 50 participants of prize-winning digital electronics contestants in industry-related skill competitions and 12 participants of digital electronics contestants who had failed in the competitions, to be the main study subjects. First, we developed the competency indicators for the digital electronics contestants for industry-related skill competitions from a literature analysis, which were then confirmed in expert reviews and from the Delphi technique, after which the questionnaire on instructors was conducted. Finally, we checked the results of the statistical analysis from the questionnaire using the IPA. Questionnaire Reliability Analysis According to the questionnaire reliability analysis conducted in the study, the overall reliability is Cronbach's a .79 for the part of the important, while the overall reliability Cronbach's a reaches .84 in the part of the performance. The result means scales in this study are generally of good reliability. Through setting the research questions, developing the research purposes, and the literature discussion, the competency indicator connotations for digital electronics contestants of industry-related skill competitions were identified to develop the questionnaire, which was then reviewed by experts and examined using the Delphi technique. Data Collating and Analysis Based on the literature and the related research data, the competency indicators for digital electronics contestants in industry-related skills competitions were established and their validities confirmed through expert review and a three-time Delphi technique analysis. Then the IPA questionnaire was conducted on the selected instructors to determine the competency indicator importance. Therefore, the data processing included both a qualitative and a quantitative assessment. Final data analysis was conducted using SPSS 19 software. Delphi Technique Questionnaire Data Analysis The three-time Delphi technique review of the questionnaires found the mean and standard deviation of each indicator to be .42 in the third questionnaire. Rigorous competency indicators were determined to allow a single sample to be conducted with the K-S verification test. The significance of 63 indicator details was smaller than .05 for the expert consensus opinions. Finally, shown in Table 3, 67 competency indicator details were identified. The IPA was in accordance with the instructor cognition importance, and the contestant performance from the teacher's view to explore the ability facets of the contestants, namely: general disciplines, professional fields, self-management, personality traits and expertise skills. The results of the two instructor groups were then compared, namely between instructors of prize-winning contestants, instructors of non-prize winning contestants. The main goal of skills competitions is to win prizes and acquire a Golden Hand Award. Winning, therefore, is closely co-related with the contestant's training and competition performance; both of which are related to the instructor training directions. 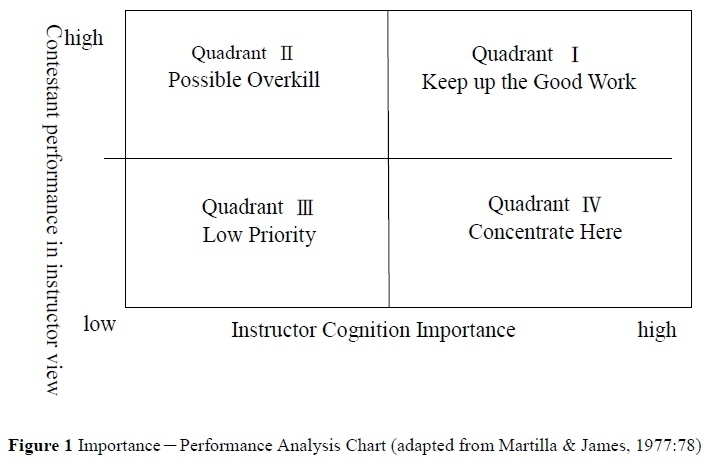 The indicator facet mean for the cognitive importance of the two instructor groups was on the x-axis and the indicator facet mean for contestant performance from the teacher's view was on the y-axis; the drop points for the indicator facets were divided into four quadrants, as shown in Figure 3. From Figure 3, it can be observed that the prize winning group of instructors paid greater attention to specialised fields (B-dimension) and professional skills (E-dimension), and lower attention to general subjects (A-dimension), self-management (C-dimension) and personality traits (D-dimension); similarly, the teachers also regarded specialised fields (B-dimension) and professional skills (E-dimension) to be the most important to winning an award in the five facets. This study used the Delphi technique method, where the competency indicators were built and subsequently divided into three categories, five facets, 17 items and 67 details. The details were then analysed using the IPA. For instructors, the professional field was found to be the most important indicator for the facets, knowledge and ability in a specialty area. In terms of contestant performance from the instructor views, specialty skill performances were seen as the more important with the ability to measure performance being the most important in this area. The results of this study found 67 specific competency indicator details for digital electronics contestants in industry-related skills competitions for national Vocational High School students. A detailed competition competency table was constructed based on previous research, expert academic opinion and instructor and teacher assessment, which could be a useful reference to verify the abilities of contestants during training. The winning group instructors identified general discipline traits such as self-management as well as personality traits as critical to winning. Winning players were also seen to have excellent knowledge in their field of expertise, and a wealth of professional knowledge that could be applied flexibly. Unsuccessful instructors need to enhance professional skills and revise training directions to enhance professional skill cognition. In the assessment of the unsuccessful players, five facets were placed lower than for the award-winning group players; therefore, if they raised their efforts to the first and second quadrants, the chances of winning would increase. This study can be used as a reference for planning vocational training courses and improving training effectiveness. From Figure 3 perspective, teachers can modify the direction of training and enhance the cognitive importance of professional skills, as self-management and professional fields and skills. In addition, the results of this study can be used as a manner of training performance, but the application of proof of vocational training methods or concepts need to be adjusted; therefore, the results of this study can be used as a cautious planning training course and progress to improve training effectiveness. Since the advent of industrialisation in the second half of the nineteenth century, skills development in South Africa has always been profoundly shaped by international factors (McGrath, 1996). For the greater part of the twentieth century, there have been periodic bouts of employer agitation regarding the need for skills development reforms (McGrath, 1996, 2004). Data obtained from South Africa point to VET as one factor that can make a positive difference on the economy as a whole, by supporting employers and benefiting individuals in tangible ways. While South Africa requires more skills, building partnerships between vocational training and the economy, particularly artisanal skills have become important. Current VET programmes may be insufficiently responsive to labour market needs. Key obstacles to a more effective response include weak work-based learning and limited artisan programmes. Therefore, it has been recommended that the workplace learning of professional skills be mandatory for vocational programmes (Field et al., 2014). A more skilled workforce will also benefit employers. A recent report from South Africa found that 36% of people were extremely concerned about the availability of key skills. According to the African Development Bank, Organisation for Economic Co-operation and Development, United Nations Development Programme and United Nations Economic Commission for Africa (2012), there was a shortage of technical and mechanical employees or electricians as well as the technical skills necessary to maintain equipment. The government needs to increase its focus on vocational training engagement, and government agencies and departments need to offer workplace training, all of which could better prepare young people for the workplace. In examining the international influences on the evolution of South Africa's skills development, we are concerned with the nature of such influences. Encouraging the growth and development of a first (modern and globalised) economy, increasing the possibility of creating jobs, implementing a programme to address the challenges of the second (subsistence) economy, and building a social security net to meet the objective of poverty alleviation (McGrath & Akoojee, 2007) are all necessary to encourage skills development. It has long been acknowledged that VET plays a key role in integrating young people in the labour market and providing skills and competences that foster innovation and entrepreneurship. More recently, VET has also been seen as a precondition to overcome the current economic crisis (Hooge, 2015). Since the institution of democracy in 1994, the South African government has made important strides in both policy and practice to provide education for all. This has gradually been coupled with the use and adoption of digital technology at all levels of the education system. The implementation of technology has strongly permeated national discourses and approaches around learning and teaching (Adukaite, Van Zyl & Cantoni, 2016). The implications from this analysis are that professional skills planning cannot be undertaken in isolation from economic growth. The South African labour force is made up of both high- and low-skilled workers, and the challenge for the economic trajectory is to respond with a supply of high- and low-skilled jobs, while still attempting to improve productivity and stimulate economic growth (Reddy, Bhorat, Powell, Visser & Arends, 2016). Finally, in an emerging economy such as South Africa, there is need to shift its focus from vocational education, such as that applying skill technology and professional knowledge to teaching.